Wizard of Oz Set Discounts Apply ! 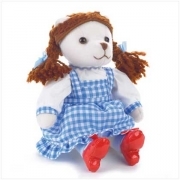 The plucky heroine is here complete with pigtails, gingham dress and even her famous ruby slippers! Scarecrow bear is huggable from the top of his pointy hat to the soles of his fuzzy feet! Complete with comical funnel hat and hard-earned "heart" fastened to his chest. 4" x 5" x 6 1/2" high. 4" x 2" x 9" high. Perfectly pretty in her iridescent pink satin gown, complete with purple star wand and crown. The Wickedest Witch there ever was is dressed in her spooky witches' clothing and complete with her trusty flying broom. 4 1/2" x 4" x 6 1/2" high. Buy all six bean bag bears and we'll include an illustrated copy of The Wizard of Oz. Follow the Yellow Brick Road and enjoy the magical journey of Dorothy and her friends in this specially adapted, illustrated version of the beloved L. Frank Baum classic.